This fresh, vibrant look is perfect for an afternoon bridal shower or brunch get together. By adding fresh flowers, you can build your own secret garden! for pitchers and teacups. Bring in bright colors during spring and summer or add some reds and oranges in the fall and winter. Don’t forget about the food! 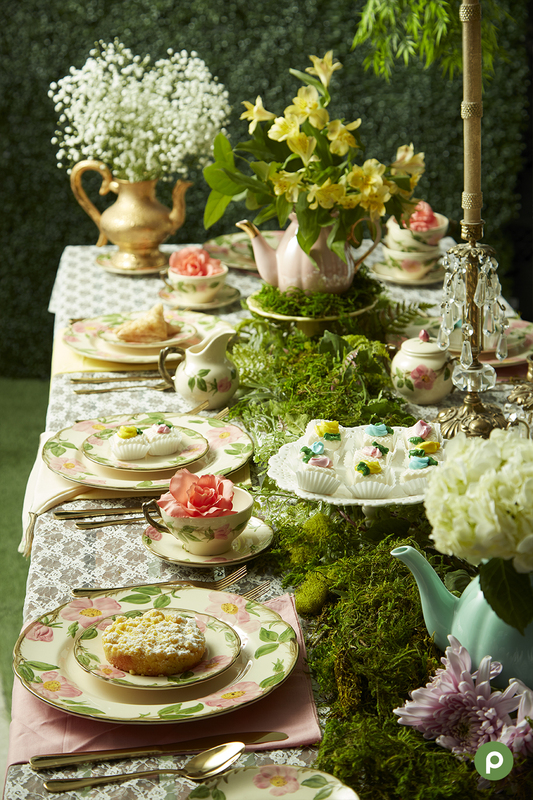 Garden Tea parties call for delicious desserts. Flower decorated petit fours, lemon crumb cakes, and croissants are perfect for early afternoon get-togethers. Make planning even easier with help from our Deli. Order our Entertainer Platter and your guests will enjoy mini croissants filled with ham, egg, tuna, chunky chicken salad and cheddar jack cheese spread. This rustic look is a beautiful option to celebrate a newly engaged couple, or bring your couple friends together for a meal. Wooden chargers are so versatile and a key to achieving this look. Use them to add a uniquely romantic touch to your centerpieces by adding some candles and greenery from our Produce Department on top of them. A rustic themed table setting can be used for any type of gathering. Our Deli offers the perfect foods to compliment this setting. With choices like smoked St. Louis style ribs, smoked pulled pork and smoked chicken, your guests will be asking for seconds! This simple and sophisticated table setting helps create a refined and elegant look that you can use during a special birthday or anniversary celebration. Enjoy a delicious meal with our Seafood Cook-In-Bags. Each meal is designed for one guest and you can choose from a variety of fish options, so you can customize each meal to your guests’ preferences. They’re easy to make, too! Just order online, pick them up in your local store, cook them for 11 to 20 minutes, then serve. This fun and colorful setting is ideal for a breakfast or brunch party with friends. Our bright flower arrangements are sure to bring smiles to your guests’ faces! Exciting, vibrant colors are the key to achieving this look. To make sure the color isn’t too overwhelming, try using a combination of three to four bright colors. Create abstract shaped designs by mixing the colors, heights and shapes of your vases. Add a pop of color to brunch and finish this colorful look with our Bakery platters. Our platters, like the mini croissant and bagelettes platter or our assorted fruit and Danish platter, are crowd favorites because they are a tasty addition to your table and make planning your party a breeze. Put your own touch on the meals with our Aprons recipes! We have hundreds of recipes to choose from that are sure to make a great meal, no matter the occasion. If you run into any problems, don’t hesitate to reach out to one of our Event Planners to get some extra help planning your next party. Are you going to use any of our tables as inspiration for your next party? We’d love to see your table setting ideas on Facebook, Twitter and Instagram.